Apple Cider Crumb Doughnuts – Spiced doughnuts with a little apple flavor from fresh apple cider and topped with cinnamon crumbs to make for the best baked doughnut you’ve ever had! Guys – did you know apple cider is incredible?? I began experimenting with it last year in my baking and I almost like it better than real apples. Yeah, I said it! Chunks of fruit can sometimes get in the way of certain treats so apple cider is a great way to get that flavor without all the hassle of chopped fruit. Case and point: these apple cider caramels. Could you imagine making these with real apples? Yeah, me either. Today’s recipe is another example of a great recipe that works better with cider than real apples: Apple Cider Crumb Doughnuts! This recipe yields the most moist doughnuts you’ve ever had, with plenty of fall spice and apple flavor to get you in the mood for the season. You’re gonna melt into a state of pure happiness as soon as you bite into it. Now, let me clear about one thing. Real apples make INCREDIBLE apple fritters. But those are a little more labor-intensive since (1) you gotta make yeast dough and (2) there is frying involved. So I am focusing on making a baked doughnut for this recipe. I mean, after two fried doughnut recipes in a row (this one and this one), I guess it’s time I make it a little easier you. For these baked doughnuts, I’m using a doughnut pan. This pan is extremely non-stick and releases the doughnuts with very little effort so I highly recommend it. And look how gorgeous they come out! You wouldn’t even know that you took the easy way out. To make the dough, it’s just as simple as making a cake or muffin batter. Once the dough is ready, I use a piping bag to help the fill the molds evenly. You can use a spoon, but that seems like it would take forever and get messy. For the crumbs, I’m using the same recipe as my classic crumb cake. They’re so easy to make since they use melted butter instead of cold butter, like some other recipes might. You simply melt butter, mix all the ingredients into a wet batter, refrigerate to make the butter solid again, and then crumble with your fingers to make gorgeous crumbs. As is true for all batters (cake, muffin, doughnuts, etc), you do NOT want to overmix. This will make the dough super tough, instead of light and fluffy. So even if you have a stand mixer, that does not mean you can walk away while everything is mixing. No, ma’am. Only let it mix until just combined. Even though this doughnut pan is super non-stick, I still spray my pan with a little non-stick spray for extra insurance. The last thing I wanted to do was pull apart doughnut pieces from the pan. This recipe calls for reduced cider to make the apple flavor more prominent, which I simply made by boiling cider for 10 minutes. Make sure to let it cool to room temperature before adding it to the batter. I love to sprinkle my doughnuts with powdered sugar for a pretty presentation. If you want to do this too, make sure the doughnuts are completely cooled, or else they’ll absorb the sugar and you won’t see it anymore. Alright, there you have it! Such an incredible fall doughnut that is so much fun to make. If you have some leftover apple cider after making these doughnuts, you HAVE to make this Apple Cider Moscow Mule. INCREDIBLE. Ginger and apple are a match made in heaven. I posted the recipe on my Instagram so click here to check it out or see it embedded below. Are you ready for the easiest fall cocktail you’ve ever made? Thanks to the Mule Cocktail Mix from @craftdcocktails, this Apple Cider Moscow Mule can be made in seconds. Apple and ginger pair perfectly together so this drink will blow you away! Check out the full recipe below! #ad ……………………………………………………………………………3 ounces apple cider 3 ounces Crafted Cocktails Mule Cocktail Mix 2 ounces vodka sprinkle of cinnamon cinnamon stick & sliced apple for garnish 1. Fill copper mug 2/3 full with ice 2. Pour cider, Mule Cocktail Mix, and vodka into mug and stir 3. Sprinkle with cinnamon and garnish with cinnamon stick and apple slice 4. Enjoy!! Spiced doughnuts with a little apple flavor from fresh apple cider and topped with cinnamon crumbs to make for the best baked doughnut you've ever had! Whisk sugars, cinnamon, and salt together in a medium mixing bowl. Add melted butter and mix with a spatula or wooden spoon to combine. Add flour 1/3 of a cup at a time. Mix until fully combined. Place in refrigerator while you make cake batter. Don't worry -it shouldn't look like crumbs yet. When ready to top the batter with crumbs, remove mixture from fridge. It should be solid. Break up the mixture with you fingers. I used a spoon to get it started. Now crumbs are ready to sprinkle over doughnuts before baking. If not using right away, place back in fridge to keep them chilled. Preheat oven to 350 degrees. Spray you doughnut pans with nonstick spray and set aside. Place cider in a medium saucepan and set on stove over medium heat. Cook until cider reduces to 3/4 cup, about 10 minutes. Remove from heat and set aside to cool. In the bowl of stand mixer, place butter and sugars and beat together until smooth. Add vanilla and 1 egg. Beat until smooth. Add other egg and beat until smooth. Add cooled reduced cider and buttermilk to batter and mix just until combined. Add all of the flour mixture to batter and mix just until combined. Do not over mix! If you notice that the batter is runny, add 1/2 cup more flour. It should be thicker than pancake batter but not as thick as brownie batter. Place batter into a plastic storage bag to make filling the doughnut mold easy. If you do want to use a storage bag, you can simply spoon it in, but that will take longer. Snip the corner of the bag and fill doughnuts molds completely. I had 12 molds so I needed to wait until the 12 cooked before making the other 4. Sprinkle crumbs (from recipe above) over the filled doughnut molds. Cover the batter completely with crumbs. Bake for 13-15 minutes, or until doughnuts begin to brown very slightly around the edges. Remove from oven and let cool for 5 minutes in the pan. Then, remove from pan and cool completely on cooling rack. If you want to sprinkle with powdered sugar, wait until completely cooled or else the doughnut will absorb the powdered sugar. If presentation is not a concern, go ahead and sprinkle when warm and eat immediately. Store doughnuts in a storage container lightly sealed with foil so that the moisture isn't trapped. Doughnuts are best on the same day but will stay good for the next day or so. omggg these look amazing! So moist, and I’m definitely going to have to try this! Those look delicious! I’d love to try those. Oh my goodness, these look fantastic! 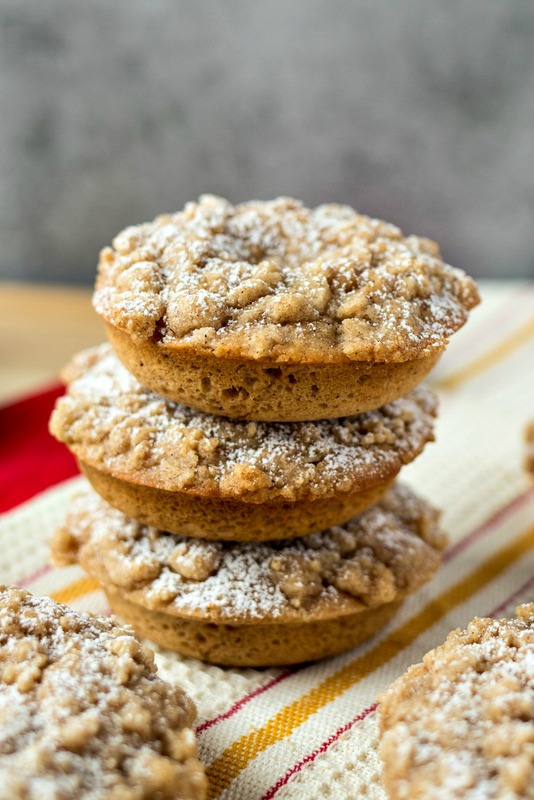 I would love a couple with my coffee this morning – and that streusel topping – delicious!! Oh my god these look absolutely amazing! I need to give this a try soon! Thank you!! I am so in love with them! Thanks so much! I am all about seasonal recipes. Make sure to check the others out! I had no idea about apple cider working so well! That’s fab! AND….I have some in the fridge and I will be making these donuts — they look so good (that topping)!! Yessss. The topping is my favorite part! These would make a great dessert for a family holiday gathering! OMG yum! Im instantly craving doughnuts and coffee! O my goodness, this recipe looks amazing! I have never thought of using apple cider in baking but it is a brilliant idea! Oh man you’re gonna love it! These look amazing!! The perfect Fall recipe! !